0 Comments Posted by Alyssa Noonan in General on Thursday, June 14th, 2018. More than half of your website visitors are navigating your page from a mobile device. If your veterinary web design is not optimized for mobile viewing, you are giving a bad impression to the majority of your visitors. But that’s not all. In today’s dog eat dog competitive landscape, your vet websites need to be eye-catching, professional, and give your clients exactly what they are looking for. if you don’t, they will go somewhere else. Read on for 5 veterinary website designs that will inspire you to put your best paw forward. You should always think about the end user when you are thinking about veterinary web design. If you run an emergency clinic, this is critical. Your visitors are likely in a state of panic over their beloved pet. They don’t have the time to wade through a bunch on navigation menus to get the info they need right this second. Consider Animal Hospital on Route 66 for an excellent example of giving the priority information from the start. Their landing page features an appropriate picture and minimal text with a easy access to the location and contact page. On the location page, you’ll find a map, contact information for the clinic and a handy directions widget. Other pages on their website feature useful information without having too much text. The about us section features a general explanation of veterinary and veterinary assistants. The meet our team page provides a picture of the staff with their pets. Including pictures of your staff is a must. 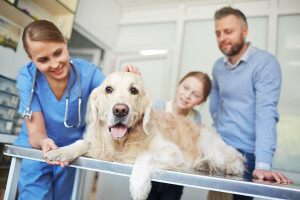 People want to make a personal connection with the people who are going to care for their furry family members. A photo builds trust – especially if it shows a pet with the staff member. One of the most important aspects of a vet websites is a clear navigation path for visitors. St. Mina Animal Hospital does a fantastic job of prominently displaying the four main areas right on the landing page. The use of icons and distinct colors is useful in drawing visitors’ eyes to this section. If you scroll further down, you’ll find an easy way for clients to request an appointment and view special offers. Having these Call to Action buttons displayed prominently increases the odds of an appointment being made. Using photos as menu buttons gives the site a clean, organized look. This layout also makes it easy for visitors to get to the info they need. Make it easy for visitors to go to the right location if you have more than one by giving them the choice right on your homepage. Lloyd Animal Medical Center is another great example of this type of navigation in use. Everyone knows that you should include testimonials to build trust. However, many organizations bury their reviews on a page that hardly ever gets any visitors. Instead, flaunt your favorable reviews right up front where your clients will be sure to see it. Consider using a slideshow landing page with reviews from happy customers or placing your reviews prominently on your homepage. Your website is the “face” of your business. It should reflect the quality of the services you offer. Excellent veterinary website designs are just one of the many services VetNetwork can assist you with.